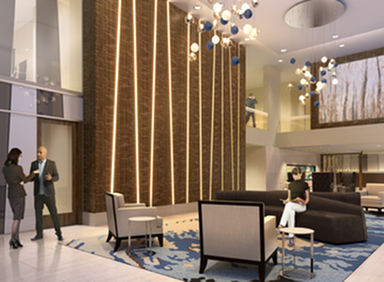 Now is the time for stylish apartments in downtown Morristown. After all, the neighborhood has expanded in the past few years with galleries, restaurants and boutiques. This very cool historic town – twice headquarters to Washington during the Revolutionary War and where Morse perfected the telegraph – is going through a modern day renaissance. Modera 44 started as an idea to take the classic elements of New England architecture and then turn that concept inside-out on the inside. The result is a stunning exterior that pays not-so-subtle homage to historic New England row houses and in-town living. Things amp up on the inside with hotel-inspired and decidedly chic social zones, of-the-moment fitness studio with yoga and spin, a vibrant rooftop deck with outdoor kitchen, sundeck and water features as well as an expansive clubhouse with free Wi-Fi. And then there are the apartments at Modera 44. Where the floor plans are thoughtful, open, filled with light, the finishes are about as luxe as they come: quartz counters, movable kitchen islands, custom cabinets, stainless appliances, upgraded fixtures. It’s all these small touches that come together to deliver a supremely comfortable apartment. Our center-of-the-Morristown-universe location has become a real destination for its walkability – our Walkscore is 95. Here in our walker’s paradise you’re close to it all, and our location is perfect if you work at one of the Fortune 500s who have a presence here. Even commuting to New York City is easy – we’re just a half-mile from the New Jersey Transit Station which gets you to Penn Station in about an hour. Live in style. Come home to Modera 44. Cool, sophisticated and urbane style in the heart of the Morristown scene. Now leasing in the heart of Morristown, NJ. Brand New Apartment Homes at Modera 55.